tragic air crash is a world unto himself and the collective loss weighs heavily on the Polish people. We would like to mention one friend, who died in the crash, Father Roman Indrzejczyk (pictured here), Chaplain to the President, and a powerful voice in the field of interfaith relations. Father Wieslaw Dawidowski, Co-Chairman of the Polish Council of Christians and Jews, has written the following words as a tribute to Fr. Indrzejczyk. The airplane crash in which the Polish President and his entourage perished on Saturday, the April 10th was a tragedy that took away a priest whose name will surely be remembered by many Jews and Catholics alike. It was Rev. Fr. Roman Indrzejczyk, the 79 year old chaplain of President Kaczyński, who was an extraordinary Roman- Catholic priest that contributed immensely to the improvement of Catholic and Jewish relationships and to the dialogue of cultures. For many years he was close friend of Kaczynski family. He made an incredibly patient and humble priest, not to mention a poet. He was always close to people who were on the margin of the Polish society and of his own church. He was a man of the Gospel who without hesitating opened his parish for the feast of Simchat Torah to welcome Jews in the midst of Christians! This celebration is organized every year in Warsaw by Polish Council of Christian and Jews to which Fr. Roman was a faithful member and a vice-chairman for two years. He was born in 1931 and was ordained a priest in 1956. For over 20 years he worked as a chaplain for a psychiatric hospital. In 1986 he became a pastor of a small parish in Warsaw Żoliborz, a section of the Capital that gathered many members of Polish Underground anti-communist opposition. He was a mountain guide and a friend of many opposition leaders from left to the right wing. That was his character: a man who searched for what united people and not what divided them. His nomination to the office of President Kaczynski’s chaplain came as a big surprise. The then-Primate of Poland, Cardinal Glemp, commented to the President “But he is a leftist priest!” Kaczyński’s response was: “That’s the point!” And so Father Indrzejczyk moved to the Presidential Palace. Fr. Indrzejczyk introduced many ideas into the spiritual life of the Kaczynski family. It was after his advice that the President initiated ecumenical prayers in president’s chapel. It was Fr. Indrzejczyk’s idea to invite Jews to the Presidential Palace for a celebration of Chanukah. Thanks to him, in the heart of Roman Catholic Poland, Chanukah lights were lit in the windows of Presidential residence. Finally, President Kaczyński became the first president of Poland who paid an official visit to the Warsaw Synagogue. Fr. Indrzejczyk was behind all this, but he humbly commented: “Mr. President is an open minded man”. In 2008 we had the great privilege to be with Fr. Indrzejczyk at the Van Leer Institute in Jerusalem to attend a Jewish –Christian seminar. Fr. Indrzejczyk was one of the speakers. He knew only a little bit of English. He spoke very softly using the most simple of words, words of a basic vocabulary. He said that it is important not to hurt each other. Words are important. Because it is with a word that we hurt one another. 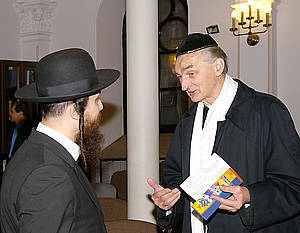 He stressed that for the Christians and Jews there is only one way left: a way of common understanding. Good Friday and Easter were the subject of yet another small controversy in the field of Jewish-Christian relations. The Good Friday homily of Papal Household preacher Fr. Raniero Cantalamessa drew, and continues to draw, international attention. Alon Goshen-Gottstein’s op-ed piece in the Jerusalem Post of April 11th tells another side of this story.The piece is reproduced in the Sharing Wisdom section below. Last week has provided us with some important lessons on Jewish-Christian relations, and in particular on how storms on the horizons of these relations come and go. Just a week ago, in his Good Friday sermon, the Papal household preacher, Father Raniero Cantalamessa, compared the treatment the Church is currently receiving in conjunction with the international pedophilia scandals with anti-Semitism. The statement was clearly outrageous and drew immediate, and well-justified condemnation from Jewish spokespersons. Fr. Cantalamessa issued an apology to whomever he may have unwittingly hurt. For all intents and purposes the storm was over. REVISITING THESE events provides some important lessons on how the public perception of Jewish-Christian relations has fallen into the pattern of moving from scandal to scandal, while failing to recognize the real changes that are quietly taking place before our eyes. As we watch the news, we remain blind to the real news. Sensationalist news headlines make us lose sight of what is truly worthy of note, novel and inspiring. I assume none of the Jewish speakers who reacted to the preacher’s statement even read his homily. They were probably reacting to a journalist who asked for a comment on some statement, and offered an appropriate response. Journalists, lifting a quote from a longer piece, set the agenda, Jewish spokespersons respond, a story is told, a scandal is created and thus our “relationships” are built. 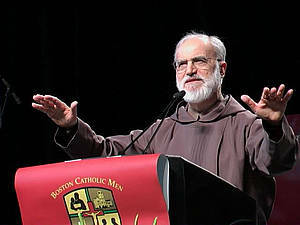 A look at what the Franciscan preacher actually said tells another story, that at the very least offsets the negative impressions generated by the statements that have made headlines. Let us remember the moment. It is Good Friday mass. The homily for Good Friday was the moment most dreaded by Jews for centuries. Following this homily, mobs would set to the streets, and Jews feared for their lives. Passion plays enacted on Good Friday were a constant source of violence towards Jews. More recently, Good Friday has constituted a problem for Jewish-Christian relations, in view of the new Latin version of the prayer for the Jews, released by Pope Benedict. Reading this, I asked myself, when before was a Good Friday sermon used for such purposes? Probably never. Why do we take this gesture of goodwill for granted? Why do we gloss over it in silence? To think of the Jews as brothers in faith during a Papal Good Friday service is the fruit of decades of labor in the field of Jewish-Christian relations. That this could be said so casually and naturally is the real news. But he does not stop here. He greets us, Jews, with words from the Mishna, quoted in the Hagadda, the most popular of Jewish texts, and echoed in Christian liturgy, a sign of bonding and unity between our communities. How often have we complained that Judaism is not simply the Biblical root, of which Christianity is the branch? How often have we emphasized the need to refer to latter day Judaism in its own right, respecting it as a self-standing religion, and not simply as the Old Testament? Does not greeting us on Good Friday in words taken from the Mishna-Haggada deliver a powerful message that something here is right and that we have made progress? We didn’t hear all this because we only noted the comparison of violent attacks on the Church with those perpetrated against the Church. But even here, we failed to hear the Jewish voice quoted by the Franciscan Father, in its fullness. It spoke of living with a common Messianic hope that will reunite us in the love of our common Father. Need I query once more when was the last time that such words were uttered at St. Peter’s on Good Friday? To all this, there is only one appropriate response, recognition and acknowledgement of the quiet yet profound significance of the moment, and so – Thank you, Fr. Cantalamessa. READING THE homily in its entirety, I am convinced that Fr. Cantalamessa’s intention was misconstrued. It is becoming harder and harder for religious people to deliver a thoughtful message, with some complexity, nuance, and historical and theological depth, without worrying about how one motif will be taken out of context and create headlines, the wrong headlines. Clearly, Cantalamessa didn’t think through the possible consequences of his statement, relying naively on the fact that they were authored by a Jewish person as a guarantee of their acceptability to Jewish ears. He has been legitimately called to task and has appropriately apologized. But we too need to express our regret at failing to hear the message as it was delivered and for allowing the media to create the wrong story, while missing the true story. 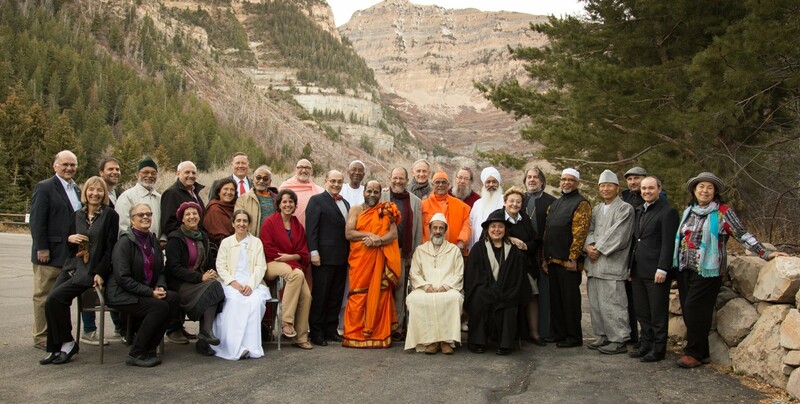 The battle against selective and superficial representation of our religious message is a common battle, on which thoughtful religious voices from all religions must collaborate. The theme of the preacher’s homily was going beyond violence. The last few couple of days show us yet again that bad listening is itself a source of violence. We have had many responses to the op-ed piece. These reactions make us aware, once again, of the importance of making Elijah and its work present in the media. In order to achieve this goal, we would like to create the position of a PR and media coordinator. Kindly consider making a donation of $10 dollar (or other sum) donation, in order to meet this need, by clicking on the following link. Thank you for the privilege of continuing to serve you.